The story of Susanna is told in the Apocryphal Book of Daniel and Susanna. Susanna, brought up by religious parents who taught her the law of Moses, married Joakim, a very rich man of Babylon at whose house the elders of the Jews met and where they held their trials. Joakin had a walled garden at this house and it was to this garden that his beautiful wife would resort when the elders came. The incident that follows shows the truth of the Lord's saying, "Wickedness came forth from Babylon, from the elders who were judges and who were supposed to govern the people" (1:5-6). Two of the judges became obsessed with Susanna because of her beauty and lusted after her. Although each was too ashamed to tell the other of his feelings, one day, after each left Joakim's house they each sneaked back to spy on Susanna and discovered their mutual lust. Resolving to seek an opportunate time, they kept a close eye on Susanna and waited for a chance to catch her alone. One very hot day, Susanna and her two maids went into the garden and Susanna decided to take a bath. She sent her two maids out for soap and olive oil and bade them to lock the gates until their return. The two elders, who were already inside the garden, ran up and demanded that Susanna yield to them: "'If you refuse, we shall give evidence against you that there was a young man with you and that was why you sent your maids away.' Susanna groaned and said, 'I see no way out. If I do this thing the penalty is death; if I do not, you will have me at your mercy. My choice is made: I will not do it. It is better to be at your mercy than to sin against the Lord'" (1:21-23). The elders promptly shouted down her cries for help and accused her, shocking everyone, for her reputation was spotless. The two elders proclaimed their story and demanded her death. Susanna "looked up to heaven through her tears, for she trusted in the Lord." The people believed the judges and assented to her death, but as she was being led away, affirming her innocence and appealing to God, "who dost know all secrets and forsee all things, thou knowest that their evidence was false" (I: 42-43), the young Daniel is inspired by the Lord to come to Susanna's aid. The rest of the elders accept his authority, seeing that "God has given you the standing of an elder" (I: 50), and Daniel proceeds to have the elders separated and questions them about the details of their story. When they disagree, he proclaims their crime and the people turn upon them, "for out of their own mouths Daniel had convicted them of giving false evidence" (I: 61) and they are stoned to death according to the law of Moses. Besides giving artists a chance to show a beautiful woman without any clothes on, the story also gives artists a chance to show the faith of Susanna and her trust that God will save her, the depravity of those who wold use the law for their own personal profit, and perhaps also to draw a comparison between Susanna and Lucrece who, in a similar situation, did not resist in the face of Tarquin's threat to kill her and a servant and tell everyone that she was taken in the act of adultery, leaving no one alive to tell her story and prevent her reputation and that of her husband from being stained. By following the biblical text and showing Susanna naked, artists might also be inviting viewers to see that like the two corrupt judges, who made Susanna unveil herself at her trial "so that they might feast their eyes upon her beauty" (I: 32), they too were not immune from this hunger. Matham's contemporary setting may also suggest that the story is still current in his own time. We present a drawing by Bernaert van Orley, and engravings by the northern masters Georg Pencz, Philips Galle (after Maarten van Heemskerck), Hans I Collaert (after Maarten van Heemskerck and after Maerten de Vos), Theodore Galle (after Maerten de Vos), and works by two of Hendrick Goltzius's followers, Jacob Matham (his step-son) and Jan Saenredam, and by Jean Cousin the Younger. Hans I Collaert (Brussels, c. 1525/30-1580, Antwerp), The Story of Susanna (4 plates) published by Gerard de Jode (Dutch, 1509-1591), 1579. Engravings after Gillis Coignet. Plate 1 inscribed "G. de Jode excud"; plate 4 signed lower left with the artists monogram "HCF" (Hans Collaert fecit). 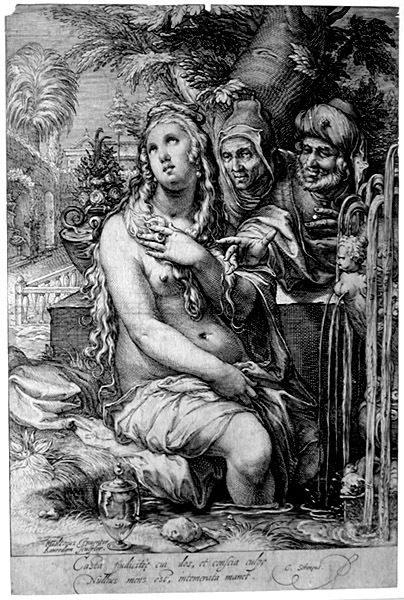 Plate 1: Susanna and the Elders (Eva/Ave, fig. 19a; New Hollstein 74 i/iii). A very good impression of the first state of three trimmed on or within the platemark. Image size: 200x261mm. Price: $1000. Hans I Collaert (Brussels, c. 1525/30-1580, Antwerp), The Story of Susanna (4 plates) published by Gerard de Jode (Dutch, 1509-1591), 1579. Engravings after Gillis Coignet. 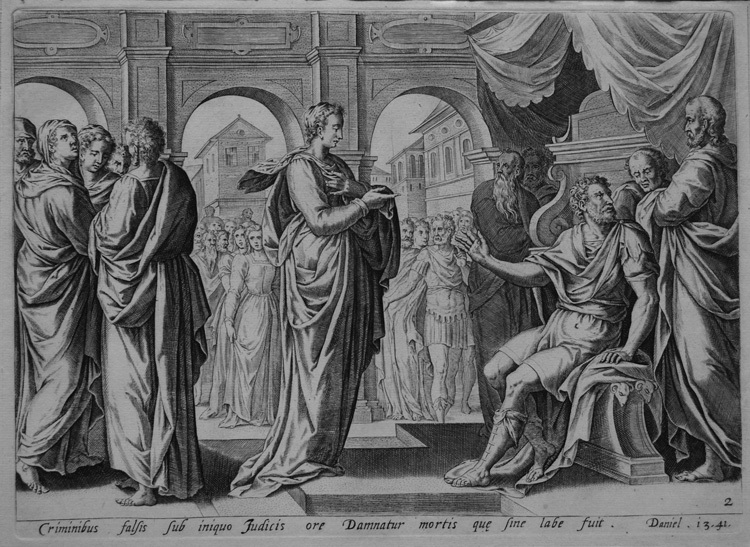 Plate 2: The Elders accusing Susanna of Adultery (New Hollstein 75 i/ii). A very good impression of the first state of two with wide margins annotated by a contemporary hand. Image size: 190x265mm. Price: $1000. Hans I Collaert (Brussels, c. 1525/30-1580, Antwerp), The Story of Susanna (4 plates) published by Gerard de Jode (Dutch, 1509-1591), 1579. Engravings after Gillis Coignet. 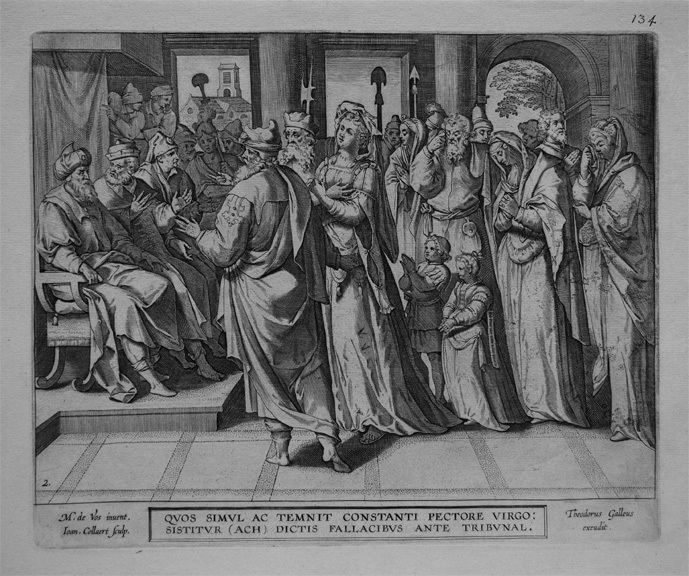 Plate 2: The Elders accusing Susanna of Adultery (New Hollstein 75 ii/ii). A very good impression of the second state of two with wide margins. In this state, a 2 has been added lower right and the verse number has been added to the chapter number in the text below the engraving. A good impression with wide margins from one of the 17th-century editions. Image size: 190x265mm. Price: $900. Hans I Collaert (Brussels, c. 1525/30-1580, Antwerp), The Story of Susanna (4 plates) published by Gerard de Jode (Dutch, 1509-1591), 1579. Engravings after Gillis Coignet. Plate 1 inscribed "G. de Jode excud"; signed lower left with the artists monogram "HCF" (Hans Collaert fecit). 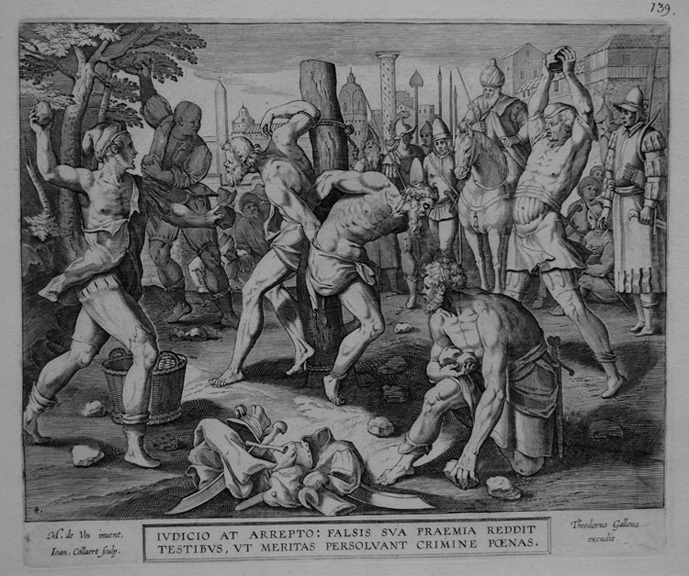 Plate 4: The Stoning of the Elders (Eva/Ave, fig. 19a; New Hollstein 77 i/iii). A very good impression of the first state of three with wide margins. Image size: 195x260mm. Price: $1000. 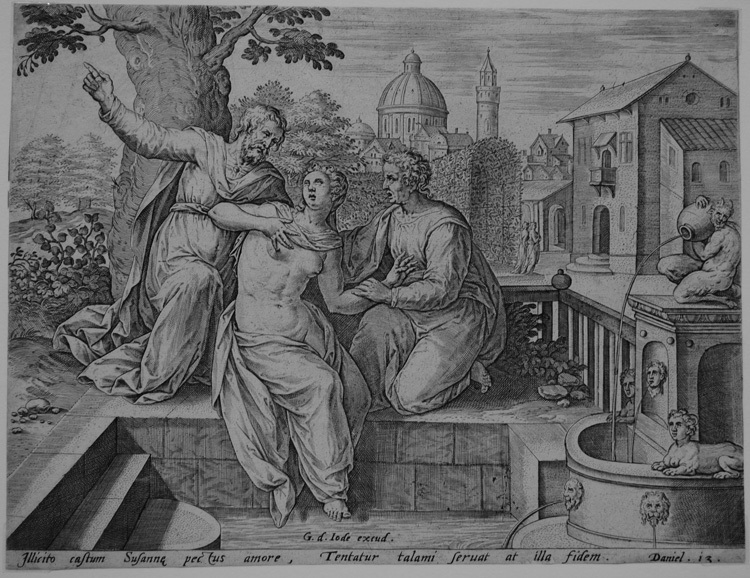 Hans I Collaert (Brussels, c. 1525/30-1580, Antwerp), The Story of Susanna (4 plates) published first by Johannes Baptista Vrints and then byTheodore Galle (Antwerp, 1571-1633). Engravings after Maerten de Vos. Plate 2 inscribed "M. de Vos inuent / Ioan. Collaert sculp." lower left and Theodorus Galleus excudit" lower right. 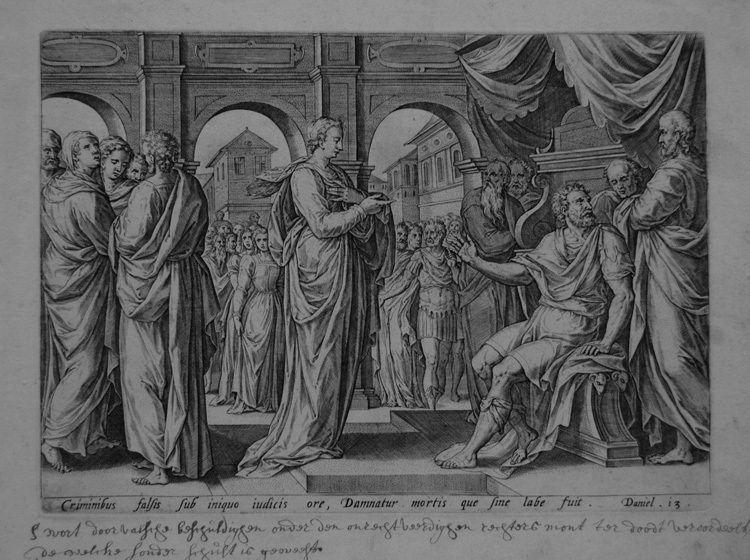 Plate 2: The Elders accusing Susanna of Adultery (New Hollstein 79 ii/ii). A very good impression of the second state of two (after the removal of Vrints' name and the addition of Galle's as publisher) with wide margins. Image size: 226x271mm. Price: $1000. Hans I Collaert (Brussels, c. 1525/30-1580, Antwerp), The Story of Susanna (4 plates) published first by Johannes Baptista Vrints and then byTheodore Galle (Antwerp, 1571-1633), and finally by Ioanes Galle. Engravings after Maerten de Vos. Plate 3 inscribed "M. de Vos inuent / Ioan. Collaert sculp." lower left and Theodorus Galleus excudit" lower right. 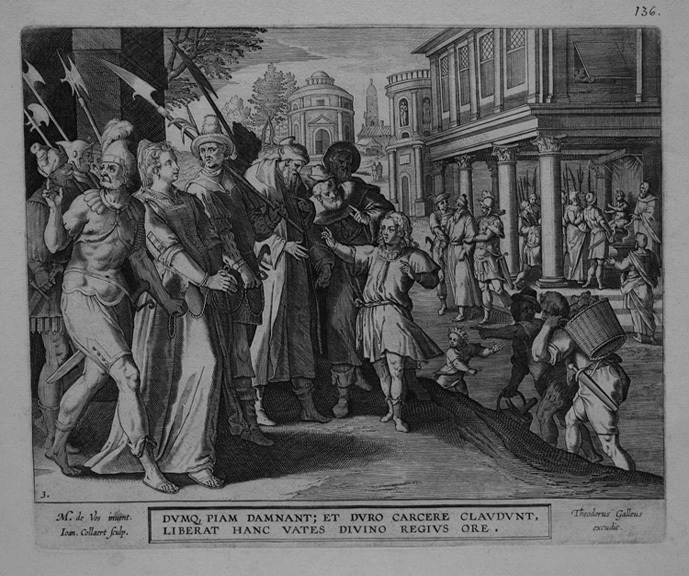 Plate 3: Daniel intervenes on behalf of Susanna (New Hollstein 80 ii/iii). A very good impression of the second state of three (after the removal of Vrints' name and the addition of Galle's as publisher and before the removal of Theodorus' name and the addition of Ioannes [Galle]) with wide margins. Image size: 213x271mm. Price: $1000. Hans I Collaert (Brussels, c. 1525/30-1580, Antwerp), The Story of Susanna (4 plates) published first by Johannes Baptista Vrints and then byTheodore Galle (Antwerp, 1571-1633), and finally by Ioanes Galle. Engravings after Maerten de Vos. Plate 4 inscribed "M. de Vos inuent / Ioan. Collaert sculp" lower left and Theodorus Galleus excudit" lower right. 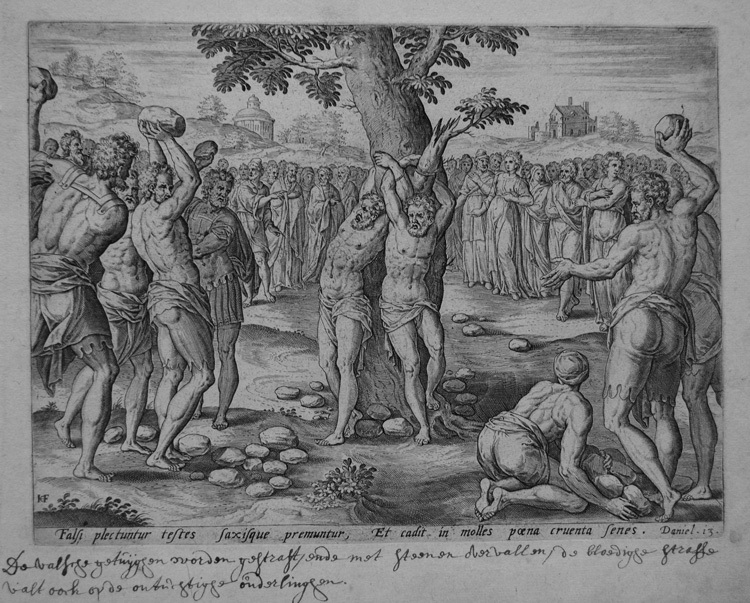 Plate 4: The Stoning of the Elders (New Hollstein 81 ii/ii). A very good impression of the second state of two (after the removal of Vrints' name and with the addition of Galle's as publisher) with wide margins. Image size: 214x269mm. Price: $1000. Theodore Galle (Dutch, 1571-1633), Thou shalt not bear false witness against thy neighbors: Daniel, Susannah, and the Elders (New Holl de Vos 80). Engraving after Maerten de Vos, after 1586. Part of a series of illustrations of the 10 Commandments by Adrien and Hans Collaert, Theodore Galle, and Crispin de Passe I. Good impression on laid paper with margins. Theodore Galle was the son of Philips Galle, an important engraver and publisher in Antwerp before it was overrun by the Spanish in the late 1570s. 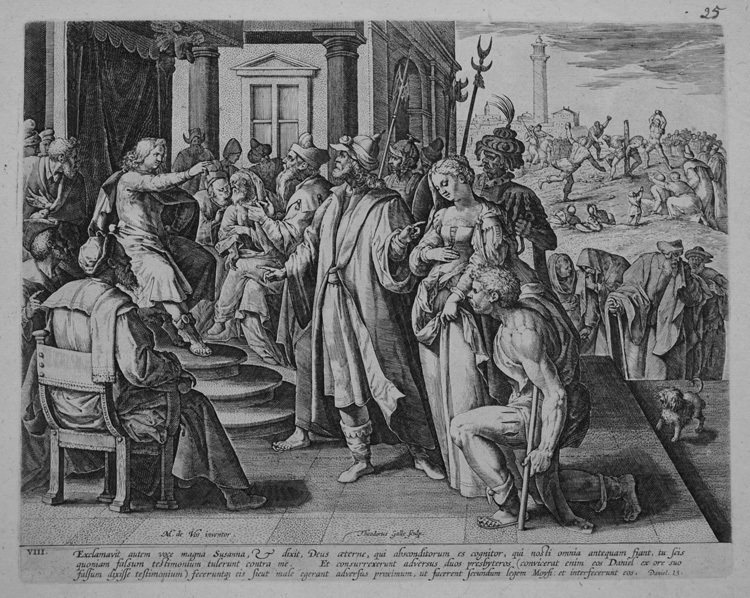 The main part of the image shows Daniel questioning the elders; in the right rear the elders are being stoned. Image size: 194x241mm. Price: $1100. Jan Saenredam (Dutch, c. 1565-1607), Susanna and the Elders (B. 42 first state). 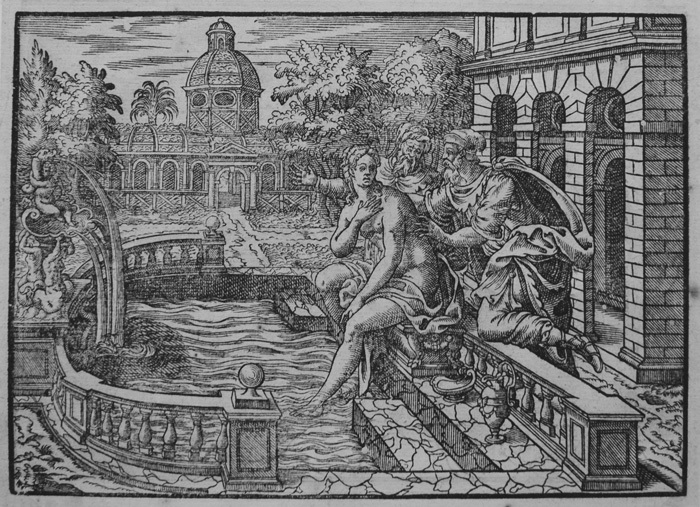 Engraving after Hendrik Goltzius before 1599. Rich early impression on laid paper. Trimmed within platemark, Small paper losses top left and top center. Signed in the plate: "HGoltzius inv. Saenredam sculptor." Saenredam was one of Goltzius' most important masters and worked closely with him, creating a major body of work. Coat of arms watermark. Image size: 154x88mm. Price: $3250. Jacob Matham (Dutch, 1571-1631), Susanna and the Elders (B. 92, Hol. 9). Engraving after Cornelis Cornelisz van Haarlem, c. 1599. Good early impression on laid paper. Trimmed within platemark. 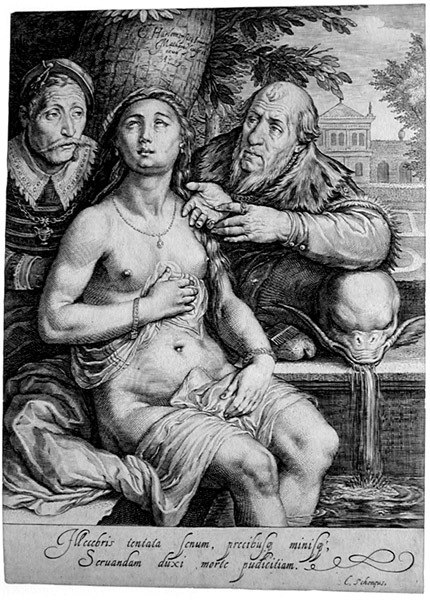 Matham was Goltzius' step-son and often worked closely with him. In this work, however, he deviates from Goltzius' model (see Saenredam's version) and sets the scene in a contemporary setting with Dutch elders in front of a late 16th-century building. A prime example of Dutch mannerist printmaking. Image size: 228x165mm. Price: $1500. Jean Cousin the Younger (French, 1522-1594), Susanne faussement accusée d'aultere / Susanna falsely accused of adultery. Original woodcut, c. 1590-1594. Published in Figures de la Sainct Bible (1596, 1614). Jean Cousin and his father were both court painters for the Valois kings. These woodcuts are strongly mannerist in style. On the verso is "Chasteté de Susanne reconnuë / Susanna's chastity is recognized." Image size: 136x191mm. Price: $850.